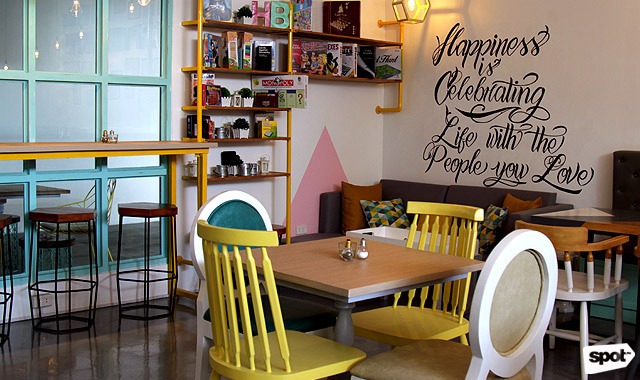 This new colorful café is an instant pick-me-up! More knickknacks are added to give the restaurant extra personality. Think small but charming details like board games, framed quotes, and light bulb salt and pepper shakers. 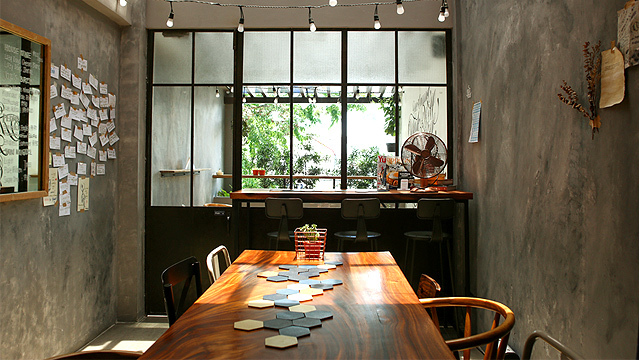 “I’m a mom of two kids, and I really wanted this to be a family-friendly café where both adults and kids can enjoy,” Jovie adds. 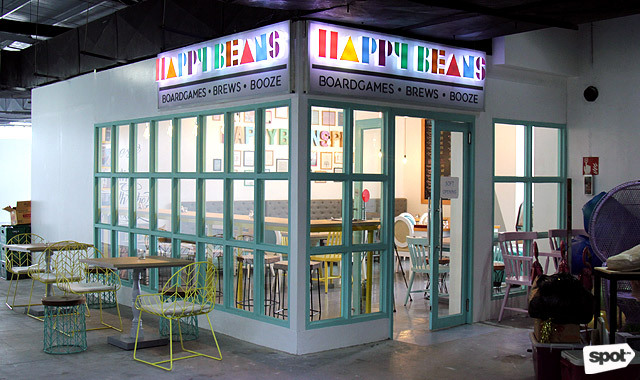 On one side, there’s a bookshelf stacked with games and books; on the other, there’s a comfortable couch for lounging; and on the counter, there are two skilled baristas smiling, waiting to take your order. 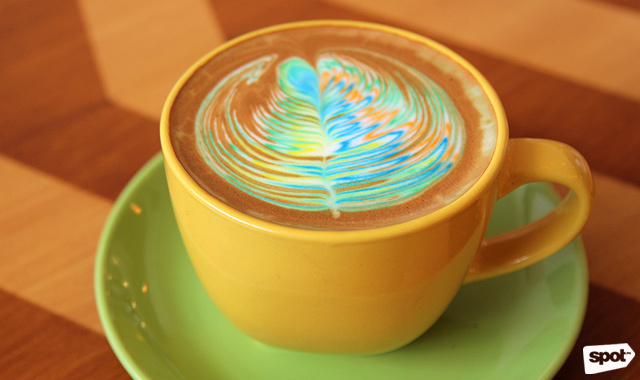 The signature Happy Beans Rainbow Coffee Latte (P128) is unlike any fancy, double tap-worthy cup of joe you’ve seen before. Milk is the key ingredient in creating this stylish brew, and Jovie says it’s not just food coloring. “That color is 99% milk and 1% a secret,” she adds with a wink. 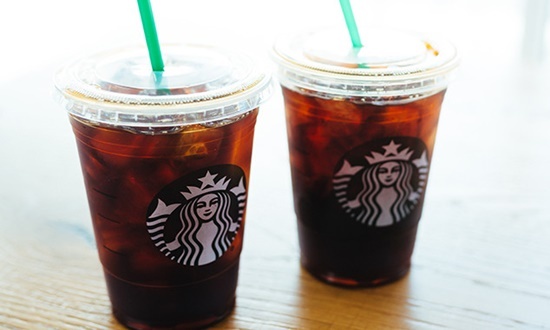 Whatever it is, it doesn’t alter the naturally strong flavor of the coffee. 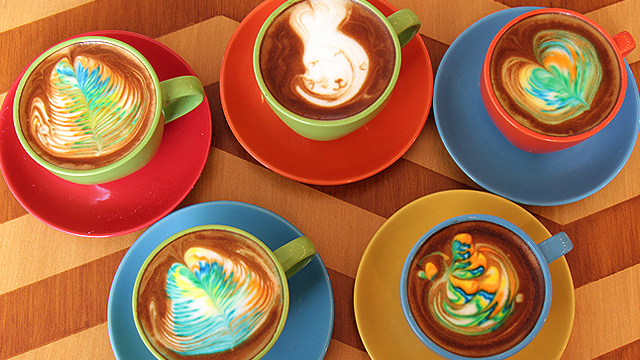 It’s medium roasted, each sip a good balance of acidity and flavor. 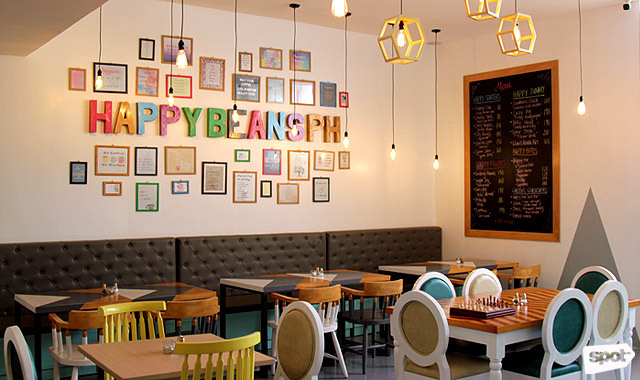 The beans are sourced locally from Benguet, a fun fact she's proud to share. 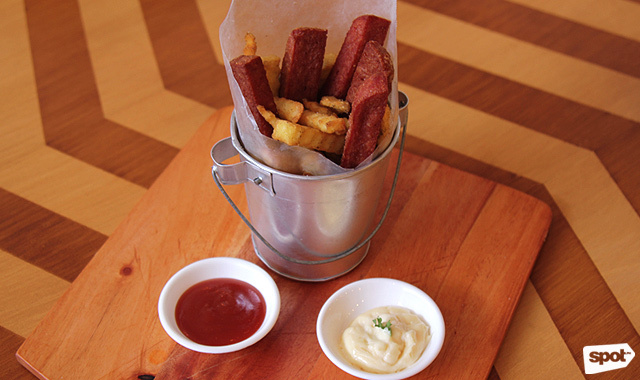 For some savory food, give the Pestorific (P188) a try. 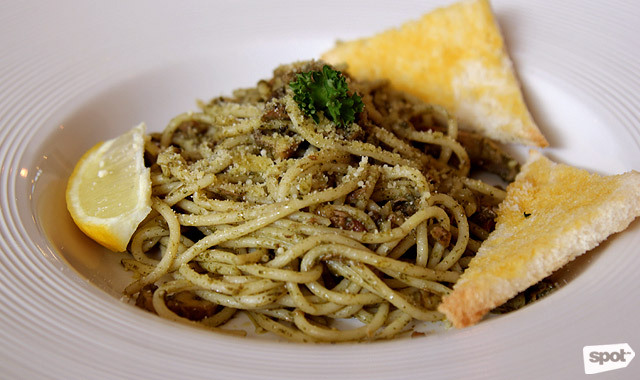 Pesto can have strong, garlicky notes, but they managed to tone it down as to not overwhelm the palate. They tossed in loads of parmesan cheese, sliced button mushrooms, and it's served with toast on the side. Squeeze the lemon for a zesty lift. 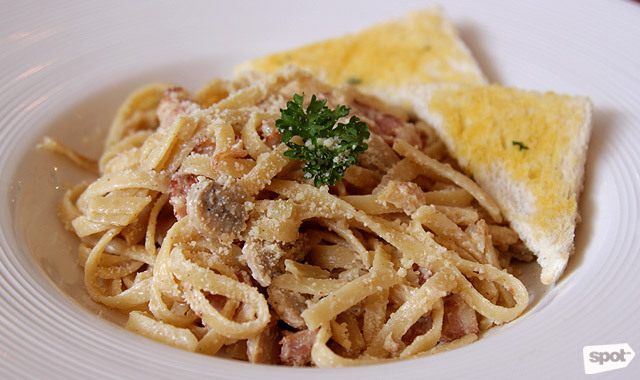 The Euphoric (P198) is carbonara bathed in a rich, cream-based sauce that’s best devoured while still hot. 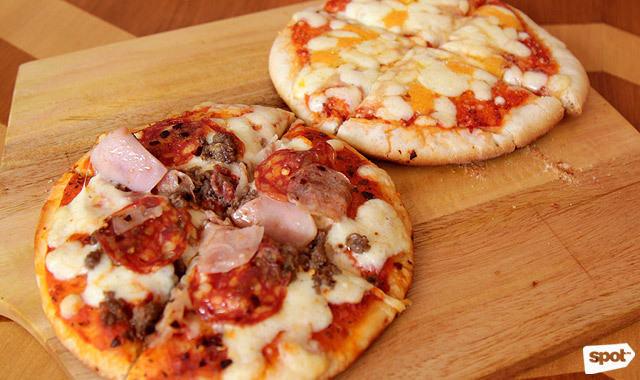 There are also six-inch pizzas on the menu; go for the Three-Cheese (P128), topped by pepperoni, meat, and veggies, and the Supremo (P148), a gooey mess of bubbling mozzarella, cheddar, and parmesan cheese. For something heavier, the Tyler Steak (P218) is a must-try. 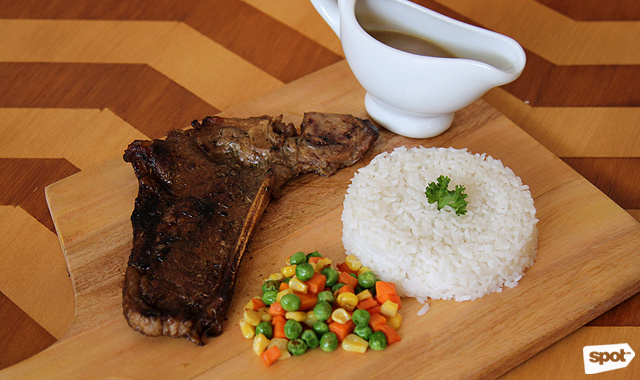 The slab of T-Bone steak is cooked just right until it’s tender and succulent, served with a mound of rice. 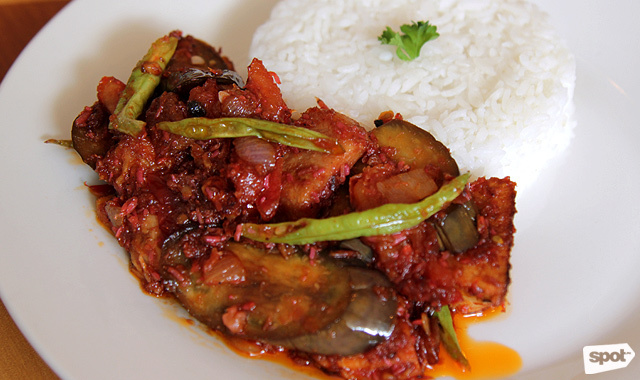 In true Pinoy style, the Lazy Pig (P198) or pork binagoongan is sautéed in tomato and stewed in shrimp paste. The chili slices garnish the dish with a welcome trail of heat. 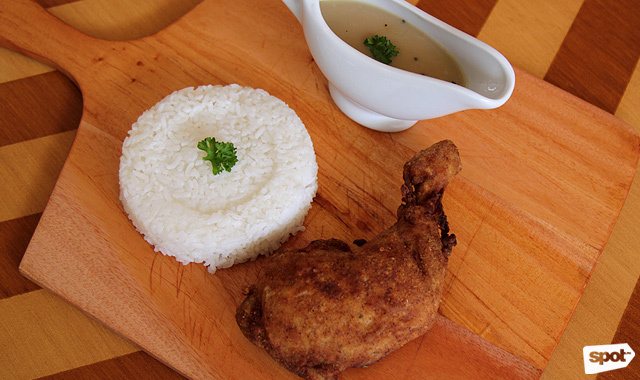 Kids will delight in the Southern Chick (P188), which is good ol’ crispy fried chicken. Come nightfall, guests opt for cocktails instead of fruity juices, and the light snacks steal the show. 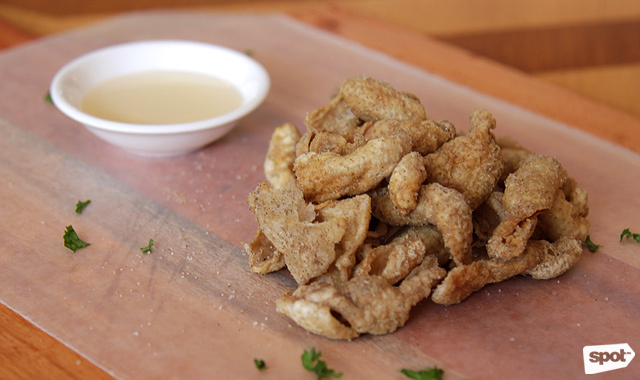 The Skinny Chix (P88) is an addictive serving of chicken skin, fried to crisp perfection and completely drained of the grease. 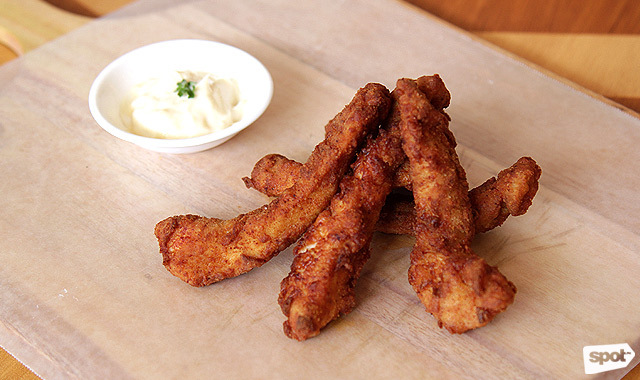 The Crazy Fingers (P108) are also a popular choice, the chicken fingers made more irresistible with garlic-mayo dip. For dessert, have a go at their cakes. 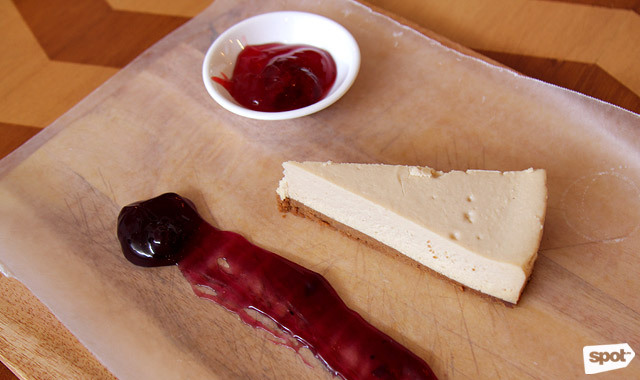 The Cheesecake (P120) is a thoughtful dessert, with the blueberry and strawberry jam served on the side. “We’d rather let them choose their topping or have them mix and match,” says Jovie. They don’t scrimp on cream cheese, and even the layer of graham crust is velvety-smooth and melts in your mouth. 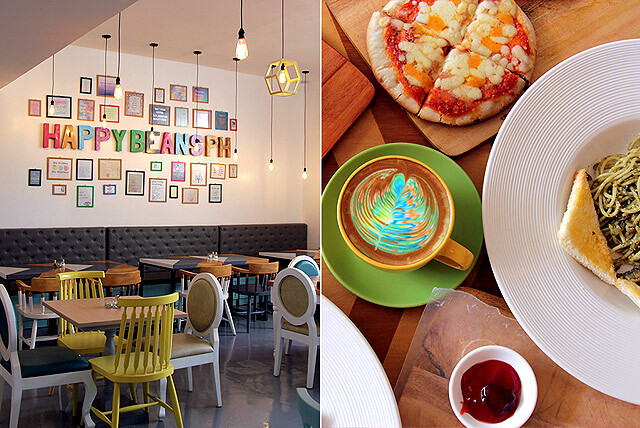 They’re still currently on soft opening, but the curiosity of café-goers grows with every colorful, expertly shot Instagram photo. 'Different' is definitely one way to describe them, but we'd say Happy Beans is also pretty good at standing out.